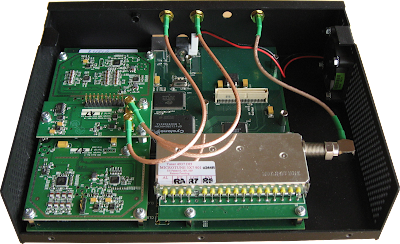 I used my Arrow II 3 element handheld yagi for 145 MHz and of course the USRP with the WBX daughterboard. On the software side I used simple WFM receiver implemented in GNU Radio Companion and a free version of WXtoImg for decoding the images. 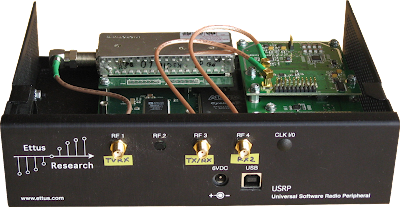 The playback program is a simple WFM receiver where the USRP source is replaced with a file source and a throttle block. The latter is necessary to maintain a constant sample rate that was used to record the data. The audio output from the demodulator is also dumped to a WAV file. 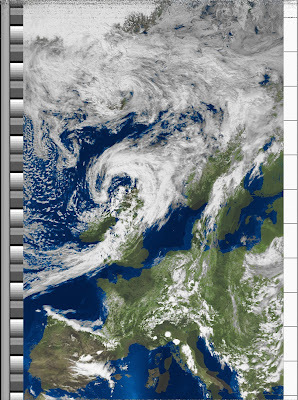 I have then transcoded tha WAV file to 16 bit signed, 11.025 kHz using VLC and Audacity, which then was decoded using wxtoimg. 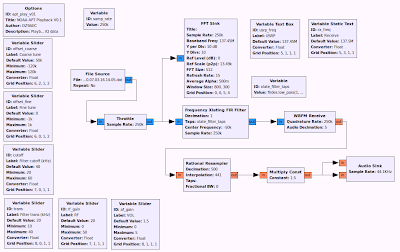 Real-time decoding could be done by feeding the audio into another computer runnign wxtoimg; however, I think the quality would be compromised be sending the audio data over two louzy sound devices. Neither GNU Radio nor wxtoimg support pulseaudio that would allow routing the audio from one application to another without going through the audio hardware. 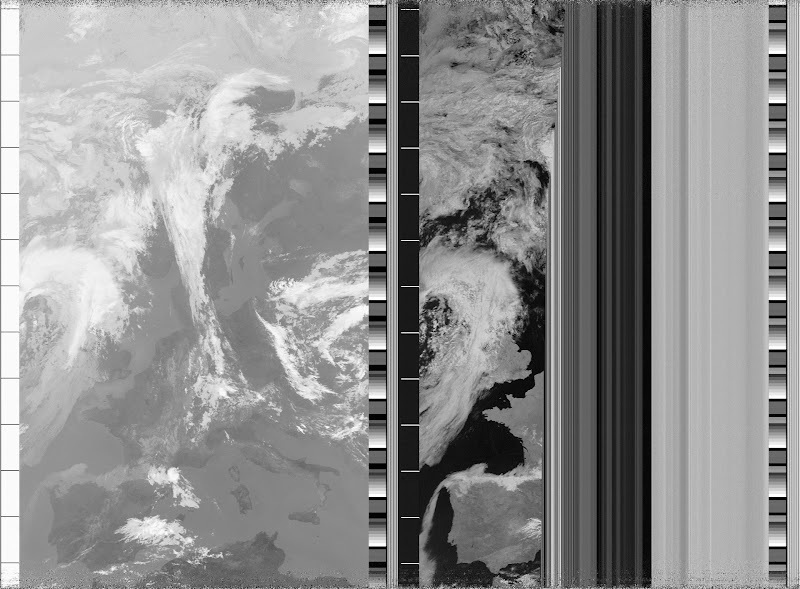 I have successfully received images from NOAA-15, NOAA-17, NOAA-18 and NOAA-19. I believe that’s the complete fleet of active NOAA POES satellites. Note the satellites transmit two images side by side, each image being taken by one of four (tbc) instruments, so that we get data from two different instruments during one pass. 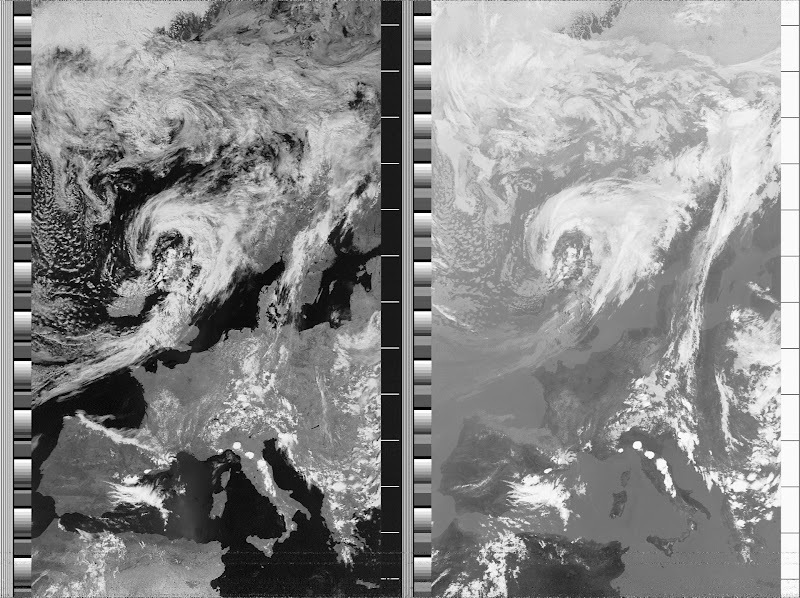 NOAA-18 was transmitting a visible and a thermal infrared image, all others were transmitting near infrared and thermal infrared images. 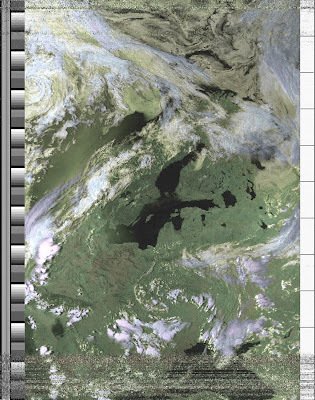 The false color images are generated by combining the two channels depending on which instrument they come from. Clicking on the images below will take you the the album page where you can get the full resolution images. This was the first pass I tried to receive and it was quite all right but not perfect.Too many trees in the way. There was no reason to try to make the false color composite images with this result since it requires both channels. 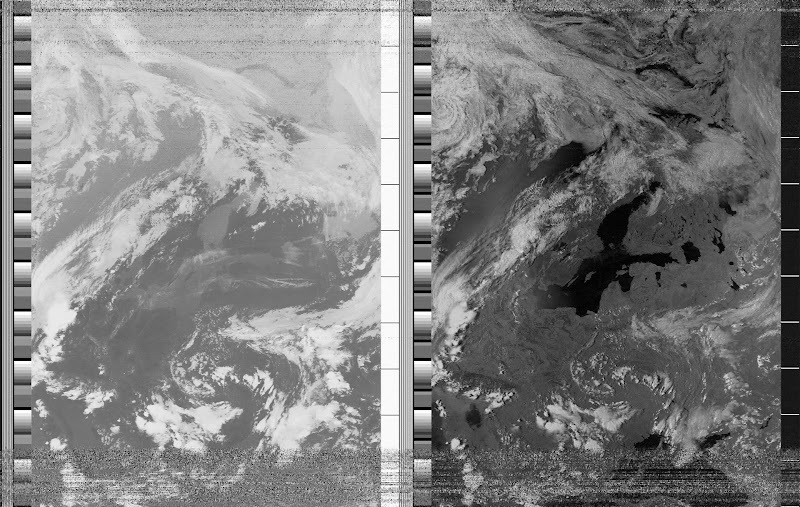 Later, I’ve been told by @claymdavis that this is a common error that used to happen with WEFAX on HF. It will clear when Goddard updates the satelite. 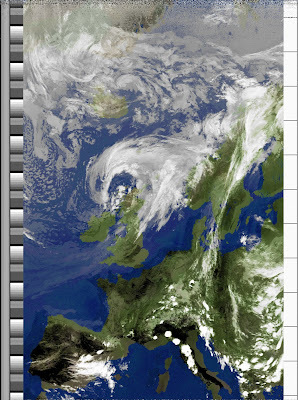 This was a good pass like NOAA-17 and this time the instruments were OK. 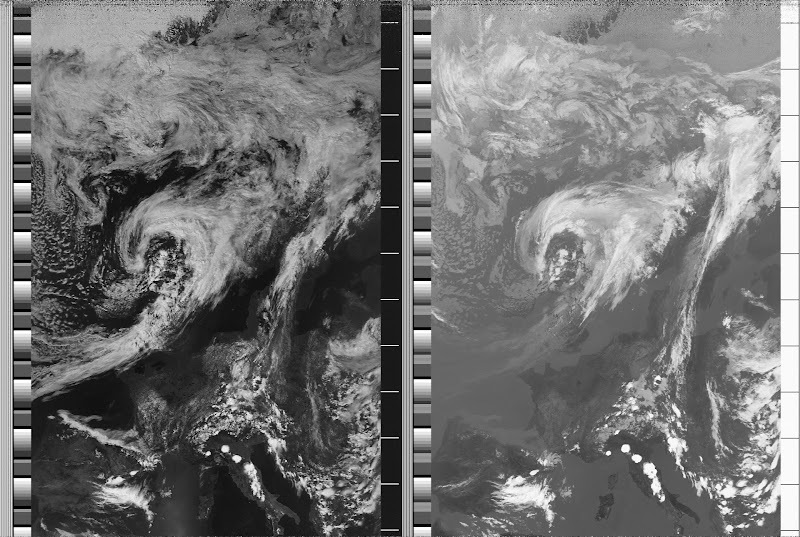 The NOAA-19 image is actually ~13 minutes ahead of the NOAA-18 image. Again, very good reception. That’s all for now as I have to get ready for next week. 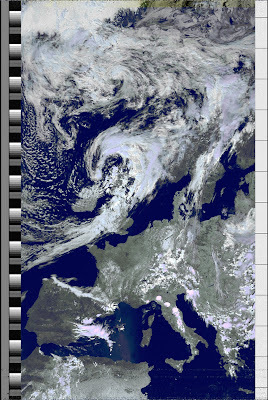 I’m looking forward to try receiving HRPT images from the NOAA satellites in the 1.7 GHz band very soon.